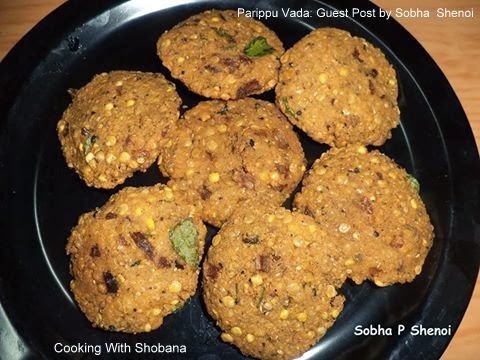 Today's guest post is from my friend, Sobha P. Shenoi who shares her recipe for these crisp and crunchy Parippu Vadas.The main ingredient is fried gram called Hoorigadle in Kannada, Vodchikaddle in Tamil and Bhuna Chana in Hindi. Soak the fried gram for 2 hours then grind it coarsely together with coriander seeds, black pepper, adding very little water. The ground paste should be dry. In making these delicious vadas, Sobha adds a tip: They should not be fried in very high flame as then the inner portions will not get cooked.